Most cat parents think that they couldn’t possibly get their cats used to it. And yet, dental disease is the most frequently diagnosed health problem in cats. On average, about seventy to ninety percent of cats have some level of dental disease. If left untreated, it can lead to health problems for your cat, ranging from bad breath, dental pain and loose teeth to systemic illnesses that can be life-threatening. 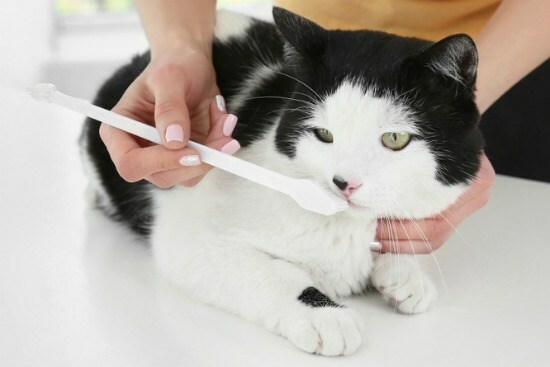 And before you say “I can’t brush my cat’s teeth,” consider that a regular effective home care program will reduce the need for professional cleanings under anesthesia, which is not only better for your cats, but also for your budget. The Cornell Feline Health Center has an exceptional 4-week training program to get your cats used to having their teeth brushed. If you follow the program step by step, there are very few cats who won’t tolerate at least some brushing. To make things even easier for you, one of the readers of The Conscious Cat, who wished to remain anonymous, has provided a transcript for each video. She found it helpful to watch the video, but then have the written instructions handy as she worked through the program. We’re sharing the videos and her transcripts, and hope that it will encourage many more of you to brush your cat’s’ teeth. You can read the journey to getting The Conscious Cat’s two cats, Allegra and Ruby, used to having their teeth brushed here. Each day put a tiny piece of toothpaste on your finger and let the cat lick it off. If the cat is shy, go ahead and put a little dab inside her mouth, so she gets accustomed to the taste of it. Follow immediately with the cat’s favorite reward. Follow the same routine as Week 1, but this time, apply the toothpaste onto one of your cat’s canine teeth with your finger. The cat parent in the video is holding back the cat’s gum (left side) with the thumb of his right hand. The rest of his hand is over the top of the cat’s head. He uses his left forefinger to put a dab of toothpaste onto a canine tooth, moving the gum out of the way. Start getting your cat used to the toothbrush. Put some toothpaste on the toothbrush and let her lick it off. If she is shy about licking it, go ahead and put some toothpaste near her mouth. But don’t attempt any brushing at this point. You start to brush your cat’s teeth. Gently stretch her lips far back enough to allow you to insert the brush into the space between the cheek and the gums. Moving fairly quickly before your cat loses patience, work your way around the upper & lower teeth on both sides of the mouth. Then, of course, immediately give the cat a reward. Position: The cat is on the bathroom counter, at the left side of the sink, facing the sink. A small tray, with toothpaste and toothbrush is in front of her, close to the sink. The cat parent in the video uses the thumb of his left hand to gently pull back the cat’s lips, with the rest of his hand circling the top of the cat’s head. Holding the Toothbrush: The toothbrush is between thumb and forefinger of the cat parent’s right hand. His hand comes from below, under the cat’s jaw, holding the toothbrush with bristles up. Note: You only need to brush the outside surfaces of the teeth. Cats don’t like opening their mouth to have the insides brushed. Fortunately, the tongue does a pretty good job keeping the insides free of plaque. Note: In the video, when the parent moves to the teeth on the side of the mouth away from him, he tilts the cat’s head up and back a little to get at those teeth. Do you brush your cat’s teeth? If not, will you give this training program a try? Thank you to The Conscious Cat reader for providing the transcript, and for The Conscious Cat and Cornell Feline Health Center for this information.